Shane McMahon and Daniel Bryan walk from backstage out to the ring area, saying that SmackDown Live is now all about the superstars and the WWE Universe. Shane and Daniel are in the ring, surrounded by the roster on the apron. Shane announces that there will be brand exclusive PPVs starting with Backlash on September 11. He also says that SmackDown needs a number one contender for Dean Ambrose’s WWE Championship. Ambrose heads to the ring and agrees with Shane. He’s ready for a new challenge. But who’s first? To decide, Daniel announces a Six-Pack Challenge for tonght, the winner becoming number one contender. He and Shane then announce the competitors: John Cena, Bray Wyatt, Dolph Ziggler, Baron Corbin, AJ Styles, and the winner of a battle royal. As far as Battle Royals go, this was fine. No huge surprises, but it was fun enough to watch. Zack Ryder seemed to be the crowd favorite towards the end, but unfortunately he screwed up a couple of moves while he was being highlighted in the match. Also, the ending felt a little like an answer to RAW, but not as exciting. Still, good for him. Renee Young approaches Apollo Crews and congratulates him. Crews says he’s happy, but he can’t celebrate until he wins later on tonight. Coming soon to SmackDown Live: Shelton Benjamin! Dolph Ziggler talks in front of a lack background, talking about getting lost somewhere along the way in his desire to be the best. Tonight is a new start. Good match. It wasn’t as hard-hitting as the Women’s Title match last night, but it was a good, solid wrestling match. It was a nice statement for the women’s division on SmackDown. Renee Young asks Becky about the match when Alexa Bliss interrupts. She says she is the personification of the new era, when Naomi interrupts. Naomi says she’s going to shine when Carmella interrupts. She starts talking when Eva Marie interrupts with a completely ridiculous intro complete with a dramatic voice-over. She comes out and doesn’t say anything. Thankfully. Baron Corbin talks about winning tonight’s match only for himself. Maryse introduces The Miz who introduces himself as his guest. He asks himself questions. He answers. Then Randy Orton heads to the ring. He makes a “playing with yourself joke” that incredibly gets a “Randy” chant. Really? The Miz warns Orton about having to face Lesnar at Summer Slam. Randy Orton thinks it’ll only take one RKO to send Brock Lesnar to Viperville (yeah, he’s still trying to get “Viperville” over). He also says that Summer Slam doesn’t have to be his first match back. He could have one tonight against the Intercontinental champ. Miz says no, and reminds him that he beat Orton for the WWE Title. Orton makes a nonsensical “pitching and catching” joke that goads Maryse into accepting the match on Miz’s behalf. Not a great match. It mostly consisted of Miz running away and Orton hitting a couple RKOs. Out of nowhere, or so I’m told. Also, there was a nearly two minute segment of the match where absolutely nothing happened. Nothing. Local Talent and John Cone are in the ring when Heath Slater runs in. He’s still upset about not being drafted. He calls out Shane and starts a “sign Heath Slater” chant. Shane comes out and tells Slater he should submit a resume. Slater tells him to go look at the WWE Network. As he’s singing his own praises, Rhyno enters the ring. A gore follows. AJ Styles thinks the “New Era” sounds a lot like the old era. He is upset about having to qualify for the chance to face Ambrose for the title. Bray Wyatt says that five men will fall tonight. Good match. It felt more spotty than either of the fatal-four-ways on RAW, but it was fun to watch. There were some nice moments and I’m quite happy with the outcome. After the match, Dean Ambrose heads to the ring and stares at Ziggler. Daniel Bryan and Shane get in the ring and congratulate Ziggler. This was a pretty good debut. It definitely could have been better, but it had some good moments. In comparison to RAW I think it came up short, but on its own I think it was enjoyable. Two segments of Miz and Orton didn’t help the show in my opinion, but the three other matches were fun to watch. 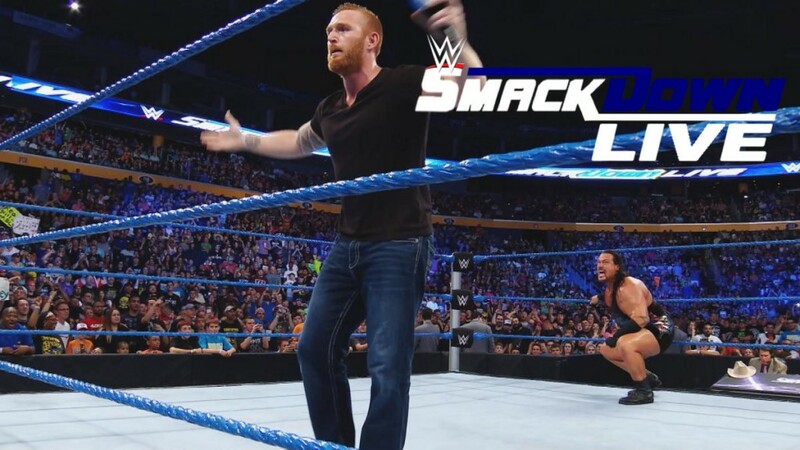 I liked the Heath Slater segment and I hope that’s not the end of his shenanigans. He really should show up on RAW as well. I also like that SmackDown is bringing in some additional people to help boost their roster, because it really was looking a little inferior when compared to RAW. I’m super pumped to have Shelton Benjamin back, and Rhyno will be fine. I’m a little unsure about their decision to make promises of what’s to come more than showcasing a lot more on the debut of the new roster. American Alpha will debut next week? I think that was a missed opportunity here. They also played around with some new camera angles. The wide shot of the ring during matches was a lot closer than usual, and it kind of roved towards the corners. It wasn’t terrible, but it did make the whole show seem different. I’m not sure if I like it yet. yeah, it was spotty, but I enjoyed it. The outcome had a lot to do with that, but I also think it showcased a lot of good things.